Yesterday, while driving to and from swimming lessons, one hour each way, I got bored, my mind wandered and I came up with a great idea....reward loyal buyers. 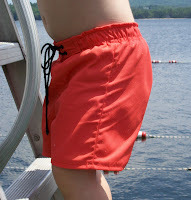 I have a wonderful friend who's son has impeccable taste...she has requested a custom order bathing suit. This will be her FIFTH purchase from my shop, http://GriffinGear.etsy.com. To reward her loyalty, she has joined the FREE SHIPPING CLUB. Any and all purchases from this point on will be shipped for free. What a Week..is it Friday yet?